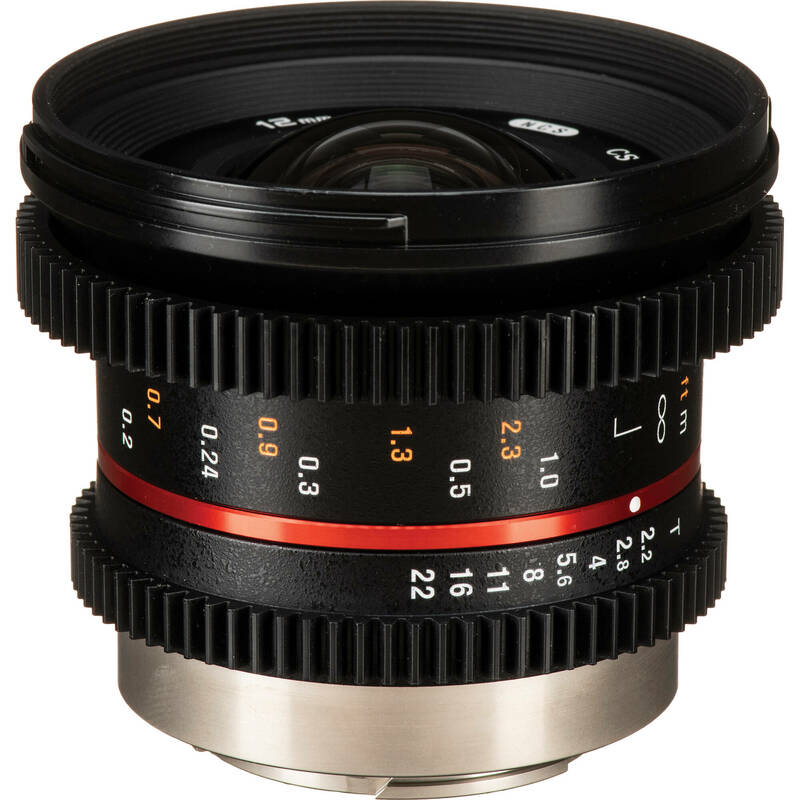 The Rokinon 12mm T2.2 Cine Lens for Fuji X Mount is a wide-angle lens optimized for digital cinematography. The lens produces an image circle that will cover APS-C sized sensors or smaller. For use with a follow focus unit, the focus and aperture rings feature industry-standard 0.8 pitch gearing. The aperture ring is also de-clicked to allow for smooth iris pulls while shooting. Focus, aperture, and depth of field markings are on the side of the lens to aid focus pullers, who typically operates on the side of the camera. With an angle of view of 98.9°, the lens is well-suited for shooting landscapes, architecture, and for use in tight interior locations. It's fast maximum aperture of T2.2 also makes the lens suitable for shooting low-light conditions. Three extra-low dispersion elements and two aspherical elements have been incorporated into the optical design to minimize chromatic aberrations and distortion in order to produce sharper images. Additionally, a Nano Coating System (NCS) has been applied to the lens elements in order to reduce surface reflections and prevent lens flare and ghosting for improved light transmission and more contrast-rich imagery. A bayonet-mount lens hood and lens pouch come included with the lens. Box Dimensions (LxWxH) 7.2 x 5.3 x 4.4"
12mm T2.2 Cine Lens for Fuji X Mount is rated 4.7 out of 5 by 3. Rated 5 out of 5 by Michael from Great value for a cine lens Bought this for my Fujifilm X-T2 System' fantastic wide angle. Really smooth aperture and focus ring. I use it on all my Fuji Camera Body's and it works really well. The build is awesome' very solid and tiny since it's a 12mm, which is great with the mirrorless system style. The focus ring is small to use if you're not using a follow focus. The quality of the glass is great, but slightly soft wide open. I guess in certain film style this can be of some advantage you could use the softness as a style of creamy look! Overall it's a great lens, cheap for a prime (cine) manual lens and high quality. Rated 5 out of 5 by August from Excellent value for money Solid image quality and weight. Bought this over the regular one to try out a cine lens - I love the de-clicked aperture for smooth exposure control. The focus ring is a tad stiff, which I didn't like at first but now enjoy the precision it allows. Rated 4 out of 5 by Allan from camera setting for Fuji X-H1 Make sure you go to the "SET UP" main menu (on X-H1), and then under the "BUTTON/DIAL SETTING" sub-menu. Set it on "Shoot without Lens" . Otherwise the shutter won't release. Good product.